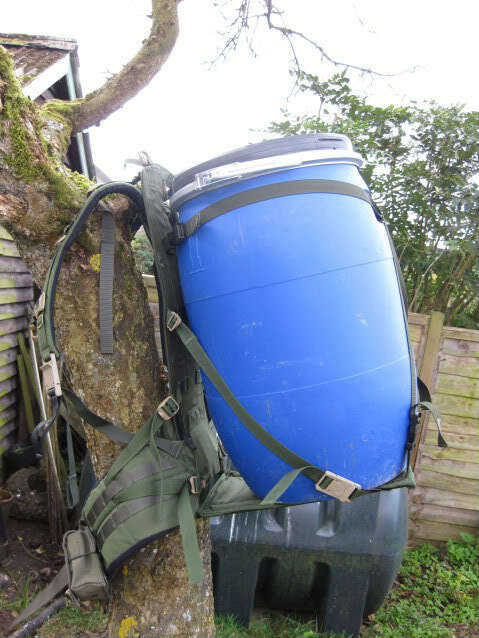 Apart from the greater load stability, the great thing about a proper external frame rucksack is you can separate the two parts and use the frame to haul awkward loads that wont easily fit into the pack (small offspring), or would puncture it (firewood) or cover it in, well blood, guts, and gore (fresh meat). The Kifaru Pack Frame is the basis of the Multi Mission Ruck, the Extended Mission Ruck and the LongHunter and it's a fantastic piece of kit. Much of the strain of carrying heavy loads comes from their instability; a tightly packed load, held as close as possible to your centre of gravitmakes the weight more comfortable to carry. The 'load side' of the frame is a High-Density Polyethylene (HDPE) plate so the load keeps it's shape, with two aluminium stays that hang the weight from belt onto your hips. The 'back side' (it goes against your back - or should that be 'person side'?) is strategically padded to reduce the contact area between back and pack whilst perching the pack on your sacrum where the belt and tabs pull the weight forward so it's 100% on your hips with the shoulder straps only keeping the pack from falling backwards. In the words of MCP 'it's basically a kind of truss'. The Kifaru Cargo Chair is a very handy accessory; you can clip it on to either the pack or the frame. It comes with two stays making it very good for carrying things with a flat base or the afore mentioned lazy offspring. Barrel pic courtesy of Jungle_re on the British Blades forum - the uber nerdy amongst you will have noticed that his Pack Frame is from an MMR (multi mission ruck) so has the quick release clips on the shoulder straps and the PALS belt for attaching pouches to. Tactical baby Tactic-cool.